General Kregg is a powerful Viltrumite officer. If this wasn’t obvious for you from the pictures, then you need to catch up with the context explained in our Invincible character profile and our Viltrumite species profile. Then you can come back here with your brand-new knowledge of Invincible basics. Height: 6’4” Weight: 260 lbs. 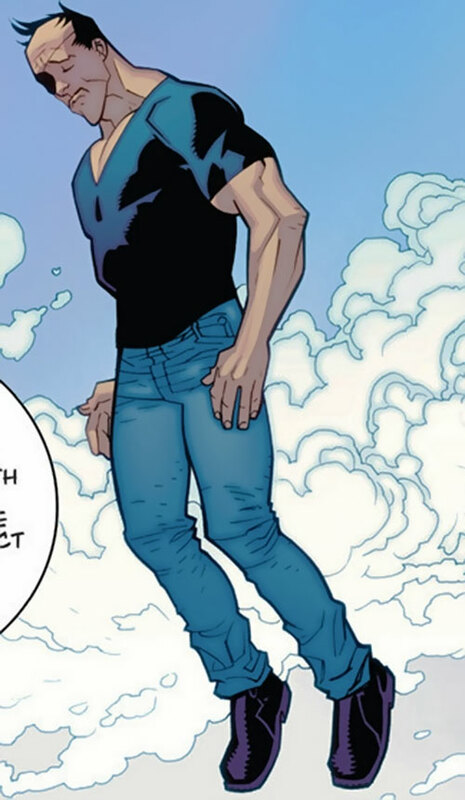 Kregg possesses the vast superhuman strength that one would expect to find in a Viltrumite male of his age, height, weight and build who engages in intensive regular exercise. Using the Marvel Handbook terminology, this places his strength level within the “Class 100+” range, allowing him to lift (press) weights far in excess of one hundred tons directly overhead. Kregg’s alien biology grants him superhuman strength, speed, durability, stamina and the gift of unaided flight. He possesses these traits at levels that dwarf those of all known Earth-born heroes and heroines. Like all Viltrumites, Kregg ages at a mere fraction of the rate that humans do. He can fully expect to live for thousands of years as long as he doesn’t meet an unexpected and violent end. See the “Generic Viltrumite” profile for a more in-depth discussion regarding the powers of an average Viltrumite. Kregg is an expert hand to hand combatant and melee fighter. He also possesses more than a passing knowledge of Viltrumite technology, astrogation, and military tactics. The bioengineered Scourge Virus (which devastated the Viltrumite race). An intense allergy to the Klaxus plant. An unusually sensitive inner ear. Kregg himself has survived exposure to the original strain of the Scourge Virus, and is presumably immune to that specific strain. As a result of that original exposure, Kregg lost his one of eyes and has had it replaced with a prosthetic. 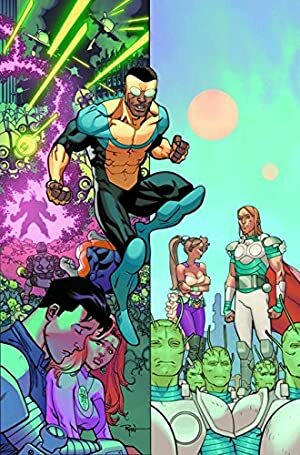 Kregg first appeared at the conclusion of the skirmish that took place on the planet Thraxxa between the Grayson family (Omni-man and his son Invincible) and the Viltrumite operatives who had been sent to retrieve them. Upon his arrival, Kregg surveyed the destruction their conflict had caused, and was pleasantly surprised by the raw strength that Omni-man’s son had obviously brought to bear during the battle. 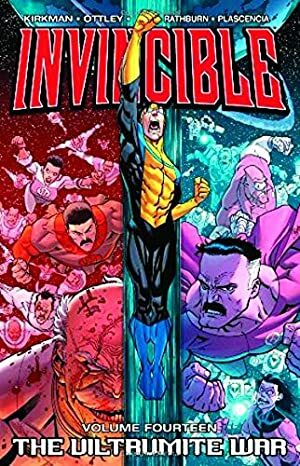 In addition to allowing Invincible to live, Kregg granted him the title of Viltrumite Agent of Earth. Kregg further gave him a time-limit to conquer the planet. He then left with the then helpless Omni-man in chains, and took him to a heavy security Viltrumite prison to recover from his wounds. Kregg returned to the prison several months later in order to ascertain if Omni-man had recovered enough to stand trial for his treason. When he saw that Nolan had recovered his strength, Kregg scheduled his execution and left. He then waited near Earth space while the Viltrumite Anissa to attempted to persuade Invincible to proceed with the subjugation of the Earth’s populace. Kregg was not overly surprised when her attempt failed to spur Nolan’s son into action. Kregg was next seen during the events of the Viltrumite War. He was one of the remaining 50 Viltrumites that participated in the battles that made up the war and personally engaged both Allen and Omni-man in battle. Both times he ended up on the losing end of the confrontation. At the conclusion of the war, Kregg was one the surviving 37 Viltrumites that settled upon the Earth in the attempts to bolster their numbers through mating with Humans. Kregg’s time on Earth was transformative for the ancient Viltrumite. In the process of carrying out his duty to the empire, he formed personal attachments to every woman that he impregnated. His love for his mates caused him to openly defy his Grand Regent’s commands. Furthermore, he began to involve himself in Earthly issues. Specifically, Kregg used his powers to save one of his lovers from harm during the Flaxxan invasion of Britain. Later still, when it was revealed that Nolan was the rightful ruler of the Viltrumite race. 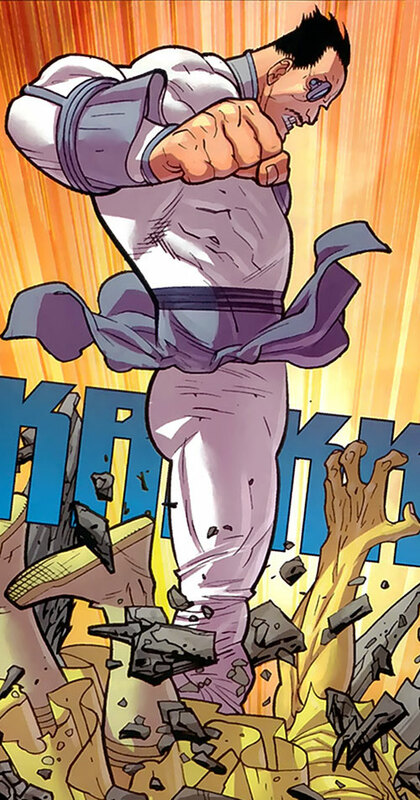 Kregg (along with three other Viltrumites) directly intervened on his behalf during his fight with Grand Regent Thragg. Their combined strength was enough to defeat Thragg and raise Nolan to his right place as Emperor of the Viltrumite Empire. General Kregg is a fairly typical member of the Viltrumite race. Outwardly he appears to be a Human Caucasian male in every way. He is a tall rugged looking man, with jet black hair and a thick mustachio that sits prominently above his lip. His entire body is covered with muscle, most prominently on his upper torso which is built like one of the worlds best body builders. Kregg’s hair is usually kept close cropped and has a noticeable widow’s peak. As a result of the period of vulnerability that he experienced while infected with the Scourge Virus, Kregg has lost his right eye. 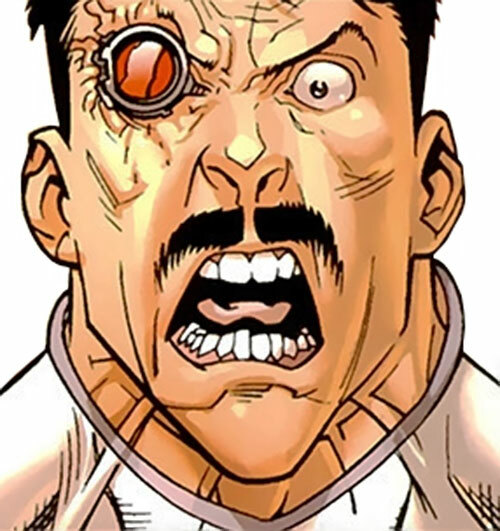 He has had it replaced with prosthetic eye, which is circular in nature with a bright red lens. 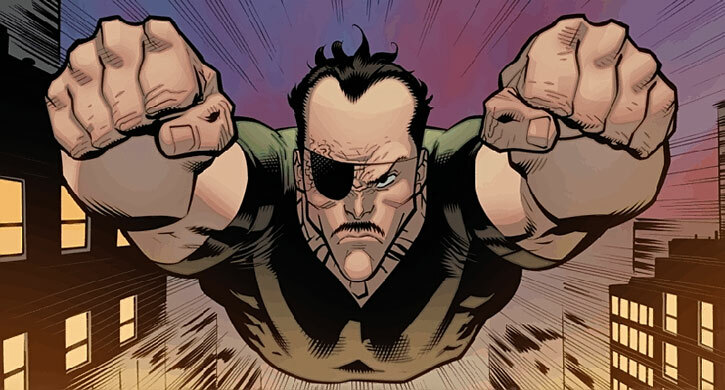 He disguises the prosthetic with a simple black eye patch when he walks amongst the human population of the Earth. Kregg’s Viltrumite attire is typical for an average Viltrumite soldier. It is a form fitting white body stocking with grey accents. A large semi-circular swath of grey surrounds the neck of his uniform, and a thin strip of grey runs down the centre of its chest. The lower torso of the uniform is completely covered by a simple grey loin cloth, and the feet are made up of sturdy grey boots. When he dresses as a human, Kregg typically wears blue jeans, a dark and tight tank top or muscle shirt and a study pair of work boots. Kregg is a fairly typical Viltrumite soldier. He values physical strength above all other attributes and will not shy away from conflict with physically superior foes. In the past, he has demonstrated an arrogance and sense of racial superiority that he flaunted in the face of all none Viltrumites. However, Kregg’s time living among humans has altered the way he perceives life. Like many of his fellow Viltrumites, he has begun to experience emotional connections with his mates and is learning to appreciate not only his own life, but to value those of beings he formerly considered his inferiors. Area Knowledge (Milky Way Galaxy), Familiarity (Viltrumite Technology), Lightning Reflexes, Near-Immortal (Potential Lifespan – 3000 years), Stabilization. Attack Vulnerability (-2CS vs attacks against the inner ear), Creepy Appearance (Missing Right Eye), Fatal Vulnerability (Scourge Virus), Gradual Loss Vulnerability (Scourge Virus, All Powers ot 0 APs and Physical Stats reduced to 02 APs, Rare), Loss Vulnerability (Klaxus Plant, All Powers and physical attributes reduced by 2CS, Rare), Minor Rage, Secret Identity. TELEPATHIC EARPLUG [BODY 03, Comprehend Languages: 06, Telepathy: 06, R#: 2 ; Limitations: Comprehend Languages: Spoken Languages only; Telepathy is for communication only – no mental battles]. 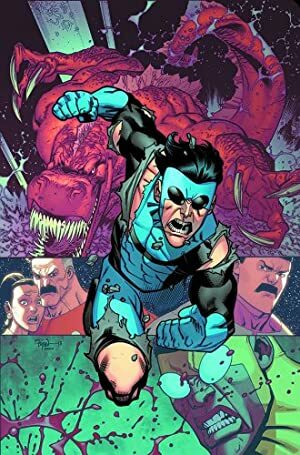 Source of Character: Image Comics Series – Invincible, created by Robert Kirkman (author), Cory Walker (illustrator/artist), Ryan Ottley (Illustrator). Writeup completed on the 1st of September, 2013.